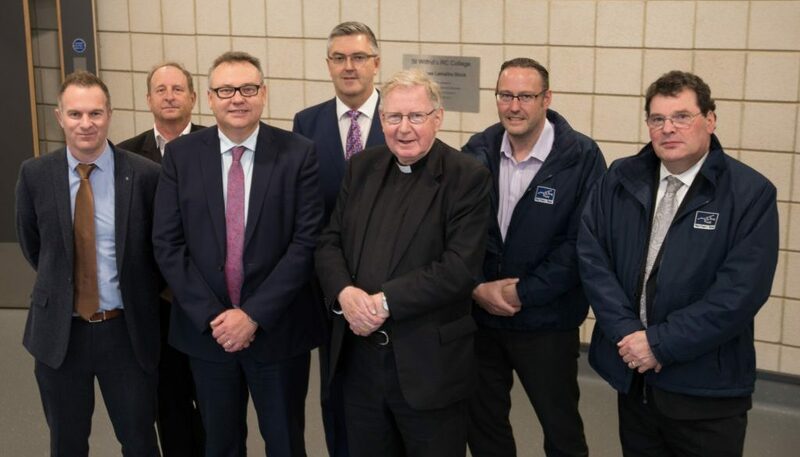 A new £3.5m state-of-the-art teaching block – built to support the learning ambitions of hundreds of students in subjects judged key to UK economic growth, has opened at an Ofsted-rated ‘outstanding’ South Tyneside School. The two storey facility at St. Wilfrid’s RC College, South Shields, where science, technology, engineering and maths (STEM) will be taught, directly supports government ambitions to reduce skills gaps in key industrial areas. Officially blessed and opened by the Bishop of Hexham and Newcastle, the Rt Rev Seamus Cunningham, it was paid for with one of the largest recent school funding grants in the country. As well as boosting the delivery of STEM subjects, it will also create more space to accommodate the Temple Park Road school’s growing pupil population, who now number around 1,100. Peter Mitchell, Head of School, said: “We asked the government for £3.5m and that is what we got. We are very happy about that. “It really is a state-of-the-art facility and from here we will teach subjects that are important to the North East and to the country. “We already teach these subjects in our curriculum, but this block will help us do that even better.” The block, which will help us to do that even better. The block, which has been named after Belgian priest, astronomer and physician Georges Lemaître, holds three science labs and new engineering and maths facilities. Building work began in spring last year and is the latest in a series of developments at the school since 2010. Financial support came through the English Schools Financial Authority following a bid to the government’s Skills Funding Agency. It was designed by architects ADP and built by Northern Bear Building Services Limited, both Newcastle based. Neil Jukes, Managing Director of Northern Bear Building Services said “This project has been a success due to the excellent teamwork of the full team, including Northern Bear Building Services, Designers and end users to ensure the building delivered exactly what is required to teach the curriculum.